The approach to creating our signature Highland Tweed was simple: Create a versatile fabric with a timeless color palette that fends off autumn and winter chills without feeling heavy on the shoulders. 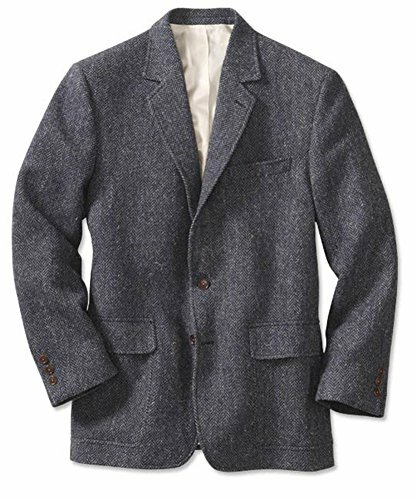 Woven by a small, family-owned tweed weaver in Scotland, Orvis Highland Tweed delivers on these criteriatry on one of these sport coats and you'll immediately agree. The patterns and colors are traditional in style yet quintessentially American, pairing handsomely with everything from cords and a wool sweater to your favorite Oxford and well-worn jeans. You'll also notice that it's significantly lighter than tweeds you may have worn in the past, yet the warmth it offers is comparable, if not better. The easy-to-wear three-button, single-vented style features two flap-over patch pockets on the outside and five interior pockets: one on the inside right chest with zipper closure for security, a left interior chest pocket with a button flap, two lower interior button flapped pockets, and a convenient interior pen pocket. Fully lined with an invisible, built-in bi-swing, which eliminates binding when sitting or reaching. Pure wool tweed. Pure polyester lining. Dry clean. Imported.Regular sizes 38-48. About 31⅝" long in size 44 regular. Long sizes 40-48. 1 1/2 " longer in body, 1/2 " longer in sleeve. Free Shipping on all orders $150 or more for all Orvis Products. Limited Time Only!